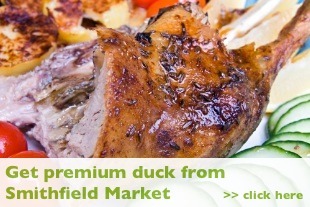 Cooking roast duck all starts by getting your roasting duck from a quality butchers, like Meat No Veg. Take your roasting duck out of the fridge and allow it to warm up for at least 30 minutes before cooking. Before you start cooking roast duck pre-heat the oven and make sure it has reached the desired temperature. Place the duck on a clean chopping board and cut away any excess fat from the neck and body cavities. Rinse the roasting duck thoroughly, inside and out, under a cold running tap and pat dry with a paper towel. Pierce the skin of the duck all over with a cocktail stick or a thin bladed knife, at 1 inch intervals especially around the legs. Rub salt and pepper into the skin of the duck. Dress the cavity with bay leaves, rosemary, cloves or garlic. Place the duck on a rack, in a roasting tray, breast side up. Pour boiling water over the duck skin and into the roasting tray and place into the oven. Plan your time for cooking roast duck by using our roasting duck cooking times table provided. Write them down, don’t forget the duck is in the oven. Turn the duck over after every 30 minutes and pour the fat out of the tray. Cook until no fat remains and the skin is crispy and brown, and the juices run out light pink. Take the duck out of the oven then wrap in foil to keep it warm. Place in a warm spot and allow the meat to rest or relax for 15 minutes before serving. There are a few things to do for next time. Make sure you warm the oven first, check its temperature before cooking, and plan your roasting duck cooking times more carefully. To carve a duck, use a sharp, sturdy knife, and a fork to keep the carcass steady. Turn the bird onto its breast and cut down through the meat which runs along the backbone. Do this on each side and then turn the duck onto its back. Now cut the meat away from the carcass, keeping the knife close to the bone then carefully cut through the leg joint. Cut the two halves of the duck between the leg and the breast and finish by cutting the leg and breast into two pieces. And there you have it: a freshly cooked and beautifully carved duck. A taste explosion.